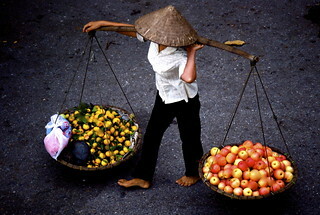 Hanoi, the capital of Vietnam, is a large, bustling city that has grown rapidly in recent years. While Hanoi reflects Vietnam’s long and tumultuous past in the ancient merchant streets of its unique Old Quarter, the colonial facades of the French Quarter, the monuments and houses of Ho Chi Minh and the relics of the struggle for independence and the “American War”, it has also embraced the open economic policies of doi moi that are transforming Vietnam. The country is experiencing an exciting period of change and Hanoi is the perfect vantage point to witness these changes. Vietnam is at a crossroads as the country navigates between Communism and open markets, a glorious (and also painful) past and an uncertain future, and increasing inequalities between rich and poor, city and countryside. One of the first semester-long study abroad opportunities in Vietnam, the HWS program in Hanoi enables students to explore an ancient Asian civilization which is undergoing a dramatic process of transition and modernization. Students will begin intensive Vietnamese language instruction through VLS (Vietnamese Language Studies) in Ho Chi Minh City upon their arrival in Vietnam, continuing under the direction of faculty from VLS in Hanoi. An internship or independent study project is required. Students will take four courses while in Vietnam. This course uses the urban environment as a laboratory to examine historical change. We will explore the effects of colonialism, neo-colonialism, the American War, and post-war reconstruction on Vietnam’s two major cities, Saigon (now Ho Chi Minh City) and Hanoi and seek to understand how the people and institutions of these cities memorialize and represent, remember and forget, their ever-changing pasts. The course seeks to answer the question: How have Ho Chi Minh City and Hanoi weathered periods of violent conflict and heroic liberation and how have their distinct histories affected the current project of national unification? In both cities, the built environment, including the public spaces, residential, commercial, industrial, and governmental buildings that were constructed and reconstructed over long periods of time, tell important historical stories. Elements of the cityscapes that were intentionally constructed or salvaged to tell specific stories—historical zones and buildings, monuments of various sorts, and museums-- can all be “read” to reveal important historical narratives that we will explore during site visits. In this course, students learn about Vietnamese history, aspects of Vietnamese culture, and current social, environmental, and political issues. Students write papers based on presentations provided by local university faculty as well as practitioners and specialists from a variety of fields, and excursions organized by CET Academic Programs and Asia Academic Experience, our on-site institutional partners. A translator is provided when necessary. Students will begin intensive instruction upon their arrival in Ho Chi Minh City and continue under the direction of faculty from VLS while in Hanoi. This course is designed to enhance the student’s ability to understand, speak, read, and write Vietnamese and follows an interactive and communication-oriented approach. Students will complete an internship arranged in collaboration with our institutional partner, Asia Academic Experience, or an independent research project overseen by a faculty member on the home campus. This program is particularly well-suited for students studying anthropology, Asian languages and cultures, English, history, literature, and media and society, as well as those in the social sciences interested in the challenges facing rapidly developing societies. The opportunity to pursue an internship makes this program accessible to a wide range of students. The program is open to all sophomores, juniors and seniors in good academic and social standing with a minimum GPA of 2.5. Students will be required to have successfully completed a Reader’s College orientation course during the spring semester preceding the program. Due to the challenging nature of study abroad, student academic and disciplinary records will be carefully screened. In Ho Chi Minh City students will be housed in double rooms in a guesthouse near the language school they will attend. In Hanoi students will be housed in double rooms in a residence operated by the Vietnamese Government. The facility is centrally located near markets and restaurants where students may take meals. Excursions are an important part of the program because they give students the opportunity to experience different areas of the country. In addition to time spent in Ho Chi Minh City and Hanoi, previous programs have visited locations including the Mekong Delta, the Central Highlands, the northern border area, Halong Bay, and coastal areas around Hoi An (an old seaport) and Hue (the imperial capital). There will also be course-related visits to various cultural and historical sites in and around Hanoi including museums, national parks, craft villages and Buddhist pagodas and pilgrimage sites. Students will be charged standard HWS tuition and fees, room fees, and a $600 administrative fee. This will cover credit for a four-course semester, health insurance, housing, and program-related activities and excursions. Note that no HWS board fee will be charged. Students should plan to bring their board fee to cover meal expenses throughout the program. We estimate that $1750-$2000 should be sufficient. Additional expenses not covered include airfare, visa, immunizations, books, and personal expenses (laundry, entertainment, ground transportation, and independent travel). We estimate airfare for this program at $1300-$1400 from the East Coast, visa at $50, and books at $200. Immunizations vary but we would estimate $125-$250. It is difficult to give an accurate estimate of personal expenses because student spending habits differ considerably. We would suggest a minimum of $1250 above and beyond meal expenses. However, students on a tight budget should be able to manage with less. If you are concerned about finances we strongly encourage you to talk to the CGE staff who can offer information and advice based on your specific situation. This program is offered every Fall semester.